JavaOne 2012 is just 19 business days away! 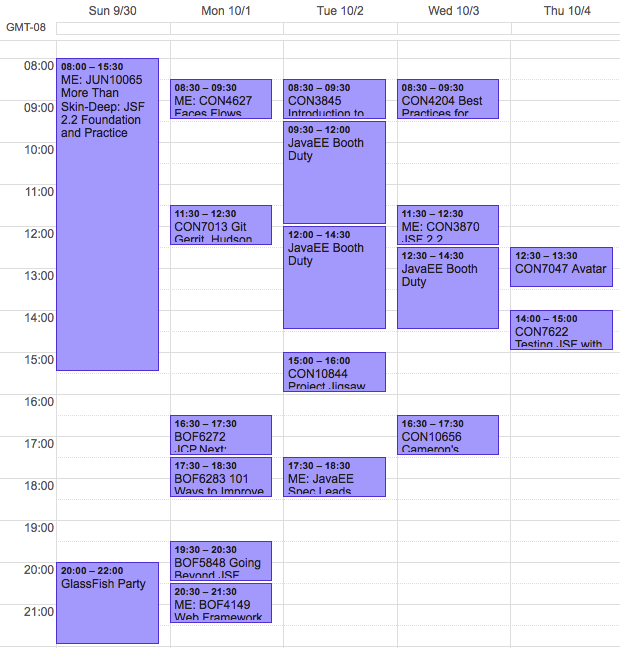 In previous years I spent the time to extract an HTML view from my google calendar to show where I would be during the week of JavaOne 2012. This year, I don't have the time to do that so I'm going to just post an image. Sorry for the degradation in usefulness. In previous years, I would have made this an image map with links to the actual sessions in the content catalog. Again, due to time constraints I must be content with just sharing a link to the Content Catalog and asking you to type in session IDs. I hope it's good enough. I defer to Voltaire, who said that the perfect is the enemy of the good. Please trust that the time I would have spent making this blog entry more useful will be spent in making my JavaOne content better!